Come along on March 19th, to our information evening on the Dublin Mountains Challenge 2014, raising funds for Barretstown. 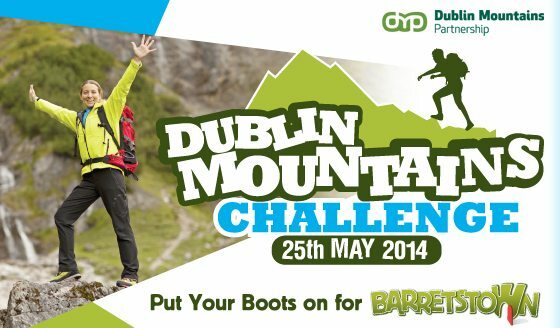 The Dublin Mountains Challenge, taking place on the 25th May, is a challenging trek through the Dublin Mountains. The event is kindly supported by the Dublin Mountains Partnership who will be with you every step of the walk. You can choose the full 42km route from Tallaght Stadium to Shankill or the 21km route from Tallaght Stadium to Fairy Castle. All funds raised from the event will go to Barretstown to help bring more children with serious illness to camps in 2014. Find out more by attending an information evening in the Great Outdoors on Wednesday 19th March at 7pm. The session will be hosted by expert rangers from the Dublin Mountains Partnership.